The Oceanside High Pirates opened their season 1-1, under fourth year head coach David Rodriquez. The Pirates lost at San Clemente 34-19 and defeated Westview in their home opener 42-29. Senior Quarterback Kyrin Beachem directs the Pirates’ high powered offense. Beachem is a threat passing and running the ball. He accounted for 274 yards in the opener against San Clemente. His talented receivers include senior Dylan York, who had a 90 yard kickoff return for a touchdown against Westview, and junior Jaylin Moncrief. Big things are expected from sophomore running back Kavika Tua, who had 4 touchdowns against Westview, including a 96 yard kick return and a touchdown catch and run sealed the win against Westview. The Pirates open their Avocado League season August 31 at home against San Marcos. Across town, the defending CIF San Diego Section Division I champion El Camino Wildcats, under head coach Michael Hobbs, opened their season with a 17-16 win at home against Pt. Loma The Wildcats come from behind win came on a last second field goal by junior Zion Jackson. El Camino lost to Cathedral Catholic 56-7 in its second game. El Camino is led by senior quarterback Brock Manber. Senior running back Rense Garner leads the ground game and junior Alexander Fetko leads the receivers. The Wildcats open their Avocado League season September 7 at La Costa Canyon. Good luck to the Pirates and Wildcats as they carry on the outstanding football tradition in Oceanside! 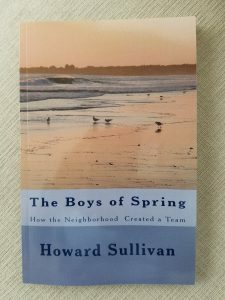 Speaking of Tradition, Howard (Butch) Sullivan just released a new book about the 1974 Oceanside Pirate baseball team. The Boys of Spring is a stroll down memory lane about one of the best baseball teams in Pirate history. Four players off that CIF Runner-up team were either drafted or played professional baseball. A fun read, the book is available on Amazon.com.